In a village of the frozen north, a child is born possessed by a strange and alien spirit, only to be cast out by her tribe and taken in by the mysterious winter witches of Irrisen, a land locked in permanent magical winter. Farther south, a young mapmaker with a penchant for forgery discovers that his sham treasure maps have begun striking gold. This is the story of Ellasif, a barbarian shield maiden who will stop at nothing to recover her missing sister, and Declan, the ne'er-do-well young spellcaster-turned-forger who wants only to prove himself to the woman he loves. Together they'll face monsters, magic, and the fury of Ellasif's own cold-hearted warriors in their quest to rescue the lost child. Yet when they finally reach the ice-walled city of Whitethrone, where trolls hold court and wolves roam the streets as men, will it be too late to save the girl from the forces of darkness? From New York Times best seller Elaine Cunningham comes a fantastic new adventure of swords and sorcery, set in the award-winning world of the Pathfinder Roleplaying Game. Winter Witch is sanctioned for use in Pathfinder Society Organized Play. Its Chronicle sheet and additional are a free download (229 KB zip/PDF). Note: This product is part of the Pathfinder Tales Subscription. 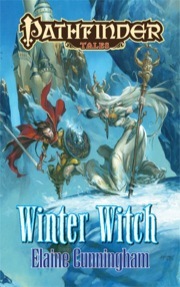 Winter Witch was the second novel published in Paizo's Pathfinder Tales line. Written by veteran fantasy novelist Elaine Cunningham, the book is primarily set in Korvosa, Irrisen, and the Land of Linnorm Kings. It's a book with both urban and wilderness elements and features both arcane and martial protagonists. An interior map and surprisingly extensive glossary are quite helpful for newcomers. Winter Witch isn't afraid to hold back on some of the mysteries it sets up until the end, and contains at least one excellent twist. It's well-grounded in Golarion-lore and its main characters and plot are interesting enough to give it a solid recommendation. The book would serve as excellent background to anyone running adventures in any of the areas where the book is set. 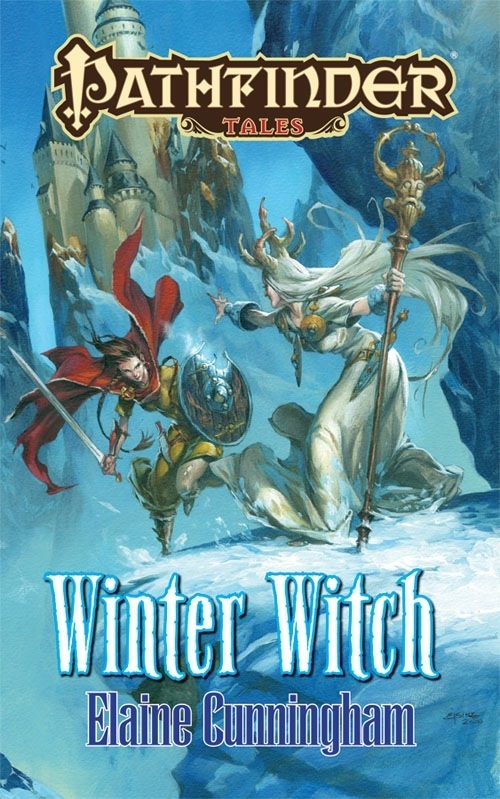 Winter Witch may not be earth-shattering, but fans of the campaign setting will definitely enjoy it; I know I did. The two leads in Winter Witch are a mapmaker (and reluctant wizard) from Korvosa named Declan Avari and a warrior shield-maiden from the Land of Linnorm Kings named Ellasif. Ellasif's sister is a witch who has ended up in Whitethrone, capital of Irrisen, after a sequence of events that are heart-rending. Ellasif makes a deal that if she can bring a powerful wizard to trade for her sister, the winter witches will let the girl go. Thus, Ellasif tricks and lures Declan to travel all the way across Varisia with her on an epic quest, the real purpose of which he is none the wiser. One of the parts about Declan I really enjoyed was his unconscious magic ability to manifest into reality things from his sketchbook. It's handled quite well in the book, and whether or not it has a Pathfinder RPG analogue, it certainly makes him distinctive and memorable compared to standard wizards. The differing cultures between Korvosa, Irrisen, and the Land of the Linnorm Kings are illustrated quite well in the novel and one can see how nurture and nature interact. For a moment it looked like the ending would take place without violence, a surprising but not unwelcome way to resolve the storyline. Instead, the book has a more conventional (if tragic) ending to Ellasif's quest. Other readers are probably more clever than I, but I was completely blind-sided by a twist involving a supporting character's real identity. I'm still not 100% sure why Declan was seen as such an attractive prospect for a winter witch in Whitethrone, but the detail is small enough that it didn't lessen my enjoyment of the book. Overall, a strong second entry in the novel line. I wish we could do 1/2 star ratings; I'd give this 3.5 stars. Not my favorite of the PF novels I've read, but still a good read. It took a while to warm up to Ellasif, who's ostensibly the main character, though I quite liked Declan (and his quasi-familiar, Skywing) from the get-go. Some of the secondary characters were quite nicely fleshed out as well. As w/ all the PF novels I've read to date, I love how they flesh out Golarion more and more to me. This is half the reason I have a subscription, and read them instead of other fantasy novels, for the time being. I know people can look down their noses at "shared world" fiction, but I don't. I can only wish in some alternate universe, these PF authors were writing novels in my beloved Greyhawk setting, but hey, you can't always get what you want, as the song says. I will say that if Elaine comes back to write another, I hope she writes a novel about the water druid (whose name escapes me) she first wrote about in that PF AP some years back. Excellent stuff, and I loved the character right away. This was the second Pathfinder Tales book I read.I found the female lead to be thoroughly unlikable and I was completely unable to relate to her. The male lead was acceptable in a naif-ish way, but I haven't got a clue about how his quirk magic ability works in Pathfinder terms. I found the plot somewhat engaging, except when the female lead was taking action. The ending is best described as rushed, predictable and flat. Was an entertaining story. Sparked my interest in the Ulfen, but the ending felt a little flat to me. But again, not bad. The god-level magic possessed by one of the characters doesn't fit with the world of Golarion IMO. The description says, "Note: This product is part of the Pathfinder Adventure Path Subscription." Congrats Elaine! Now stop hiding behind that book on Facebook! Hurrah! Can't wait to read the finished work. Pathfinder fiction needs its own separate subscription. Yes, yes, yes, oh, fricking awesome, yes. And also . . . yes! Not, not my most eloquent post, but I'm extremely happy with this announcement. The sooner it becomes available, the sooner I subscribe. What pace do they expect the books to come out? 2-4/ year? or more than that? After the first pair, which are a month apart, we'll be going to every three months or so. I like how you guys rewarded the authors that wrote for the Adventure Paths. Thank you for giving them the honor of starting off your Pathfinder Fiction line. You guys rock. I'm pretty sure it's less reward and more a matter of working with people they know and trust instead of a bunch of unknowns. This is too awesome. I'm definitely subscribing to this. Mass market paperbacks for $9.99? That seems a bit...steep, no? So, when will we see the first Planar Novel written by a certain Todd S. (wait, people could figure that out, let' call him T. Steward!)? It is a bit on the high end but not out of line with newer books, but it is where we needed to be to make these books a go. I wish we could have hit $7.99 but that just wasn't possible unless we could print a LOT of books. Here is to hoping that this line is so successful that on subsequent books we can print a LOT of books and lower the price! From your lips (or would that be fingers?) to the gods' ears. I'm glad Paizo chose the mass market format rather than the larger and more expensive trade paperback. If it's fingers, it's eyes, too. I'm looking forward to this. Elaine's story was the first Pathfinder fiction I actually read (having skipped over it in previous Adventure Paths). As I grow older I find myself more finicky about the fantasy I read (which is a shame because I used to love everything, and I almost resent whatever it is that's changed about me). Nevertheless, her half-elven water druid was a real treat. And Irrisen's a real winner in chpoice of location and topic! Go Elaine! You won me over the first time, I have no doubts you'll do it again! Wait: You hide your face behind a book on a page called facebook? My only problem is lack of bookshelf space. Hmm, clear out some of the old Cormyr stuff to make space for this? OMFG! sorry, hem can't wait! Elaine Is one of my all-time-favorite authors! The sooner you set up the subscription, the sooner I subscribe. I need to see a subscription link on this ASAP! As a collector of RPG fiction I can't wait to sink my teeth into more Pathfinder lore. Don't worry, you may see some level of easter-egging between the two, but we'd never put spoilers for one in the other. We haven't even outlined Witchwar Legacy yet and Elaine is still writing The Winter Witch. The two products (one a module and one a novel) both take place in the same nation at roughly the same time period, but deal with vastly different elements. I think it will be fun to throw some novel Easter eggs in the module, but you will not need to read one to enjoy the other, and you needn't approach them in a specific order. Do keep checking back, please. I can't wait. And $10 is great; to my way of thinking that's $5 for a hard copy and $5 for an ebook. Pathfinder Fiction Subscriptions are now available. I can't wait. Elaine's writing is fantastic and so is the subject matter! You know, it looks fine on the full-size picture, but that barbarian's fur just looks inappropriate at thumbnail size.